Being away from home for Mother’s Day was hard. Mostly because I know that it was hard for my mom and grandmothers. So I made sure I sent home gifts and scheduled a Skype call with my mom that I even shaved for. I’m not as worried about Father’s Day. No, not because I care less about my father. That’s not true at all. I just know that my dad will be his happiest on a golf course playing 36 holes at the minimum. Throw in some Italian food for dinner and I’m pretty sure that’s his perfect day. I’ve never been the greatest golfer, though. That’s one thing that my brother shares with my dad that I don’t. For my dad and I, football and hockey have always been our connection. In fact, I’ve scheduled my last two trips back to Chicago around being able to attend Blackhawks and Bears games with my dad. I wish that I could afford to fly my dad out west for the Bears-Raiders game next season as his Father’s Day gift. Unfortunately, too many friends getting married this year has left my budget for such a gift depleted. Makes me miss the days of finger paintings and macaroni necklaces. I’ll probably have to settle for some of those new novelty golf balls with the dimple pattern that makes them fly straight every time. They’re not PGA legal, but I’m sure my dad will have a good time conning some of his buddies out on the course. Those and a card that will make him laugh should do the trick. Celebrate Father’s Day with your subscribers with a Benchmark Father’s Day email template. Share your favorite father’s day gift you’ve given or gotten. I know there’s one gift my dad has never turned down, and that’s a good sale. Seeing four gallons of orange juice in my refrigerator back at home was never a rare occurrence. He’d grab as many as he could whenever it went on sale. 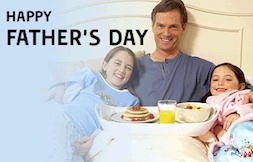 Father’s Day is a great opportunity for promotions and sales, so start planning your Father’s Day email campaigns now.